View of “Lorraine O’Grady: From Me to Them to Me Again,” 2018, Savannah College of Art and Design, Georgia. Lorraine O’Grady’s longtime engagement with the diptych, as seen in her recent collage series “Cutting Out CONYT,” 1977/2017, which she discusses below, is highlighted in two solo exhibitions this fall: one is on view at Alexander Gray Associates in New York through December 15, 2018, and the other is at the SCAD Museum of Art in Savannah, Georgia through January 13, 2019. 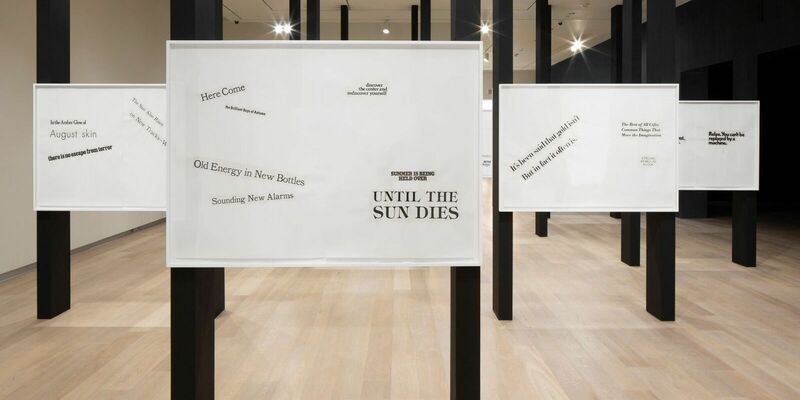 “Cutting Out CONYT” is a radical selection from her earliest artwork, “Cutting Out the New York Times (CONYT),” 1977, now reworked and distilled into what she calls “haiku diptychs.” The eminent New York–based artist and critic also has a solo show at the Museum of Fine Arts in Boston, which runs until December 2, 2018. Rejoice. I taught a course in Futurism, Dada, and Surrealism at the School of Visual Arts for twenty years. I admired those artists that dodged the draft in World War I and went off to Zurich. But I also felt they’d suffered an acute shock: Their teachers and parents, formed in the nineteenth century, had led them to believe that European culture was built on the mind, on rationality. And then, of course, they’d had to face the irrationality of European culture with the outbreak of a war that even today makes no real sense. Their response to that was to willingly surrender to the irrationality they’d witnessed, and to create from the language of the subconscious a sur-realité, an above-reality. While I understood their need to surrender to the random, that could never ever interest me as a goal, since I’d always felt the culture I was immersed in was completely irrational. My trajectory instead was not to surrender but to try to conquer the random, to wrest some rationality from the irrationality that so many “others” to the normative culture have to live with. Excerpts from an interview with Lorraine O'Grady. When I hit the New York art world in the early 1980s, it was a shock to my system. Not only was it segregated between racesit was also segregated along lines that were so subjective there was no logical countering of them. Everywhere I’d been in the world up to that point there had at least been objective measurements of my accomplishments, from SATs to exams for federal service. The year I graduated from college, out of twenty thousand who took the Management Intern Exam I was one of two hundred, and the first girl from Wellesley, to pass. I didn’t have to prove myself. And later, when I became a translator, I mean, either you could translate accurately or you couldn’t. So when you come in to the art world and you see a totalized worldview that is quite provincial, because it’s isolated everything but itself, and that’s what’s telling you that you are derivativethat you are not interestingwell, it seemed a little out of line with reality. But now I think it was more like a dislocation from reality, an exaggeration of the irrationality that, as a woman of color, I had experienced all along. What I found in Surrealist language was the obverse of what the Surrealists had found: it enabled me not to surrender to the random but to control it. That’s why I did “Cutting Out the New York Times (CONYT)” in 1977. During the 1960s Cuban Missile Crisis I’d been a contract analyst at the Department of State and had to read like ten newspapers and three transcripts of Cuban radio a day, so language had just melted away at that point. I wanted to see if I could take the public language of the New York Times and make it personal. And unlike the confessional poets of the time who confessed from the inside out, I wanted to see if I could create a “counter-confessional” poetry that would “confess” from the outside in. In 2017, forty years later, I felt an urgent need to reconnect to the voice of that 1977 piece, which I’d begun as a writer but finished more as a visual artist. The shock of entering the art world in 1980 had caused a distortion in what I produced, it seemed, away from the more experiential and toward the more argumentative. I wanted to go back to that earlier voice so as to get on with new work. “Cutting Out the New York Times (CONYT)” had succeeded in its first goal to make public language private, but it had failed, I believed, in its second goalto create counter-confessional poetry. Too many rules of cutout composition had overwhelmed those poems of ten and twelve or even more panels each. But I thought forty years of experience might correct the failure. And they did. At first, I felt simple relief. I called the show at the Savannah College of Art and Design “From Me to Them to Me Again” to signal a return. But now I think that was the wrong title. I should have called it “From Me to Them to We Again.” Because creating these totally new haiku-like objects in “Cutting Out CONYT” had not only illuminated the role of the diptych in my personal work, it had given me a glimpse into what might be my contribution to culture as a whole.